The company has been founded by Yvonne and Christof Wilke in 1986. The first yard was situated in Faulensee on the lake of Thun in the beautiful Berner Oberland. Since 1993 the yard is situated in Leissigen, just a few miles from the old location. The yard focused originally on the building of Oneoff lakeracers as well as the maintenance of existing craft on the lake. Following the worldwide success in the building of Int. 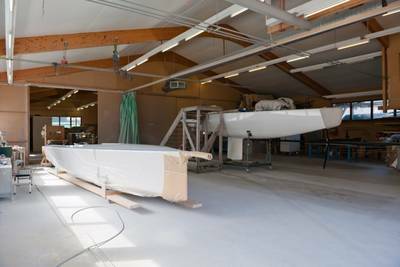 5.5m yachts and Finn-masts, the focus has been moved towards high-performance composite construction.